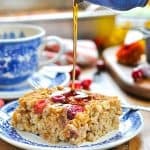 You only need about 10 minutes of prep to pull together this Cranberry Baked Oatmeal for a delicious and healthy make ahead breakfast casserole! 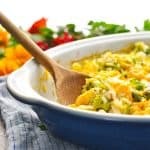 You only need about 10 minutes of prep to pull together a delicious and healthy breakfast casserole! 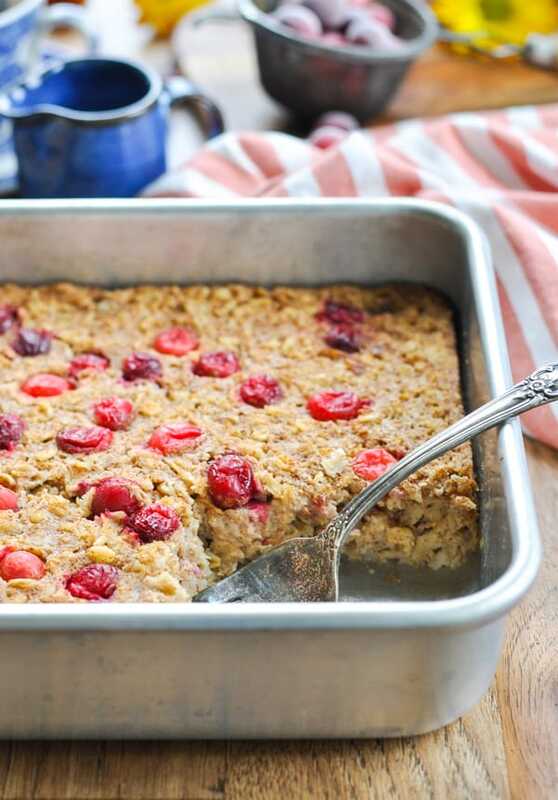 This Cranberry Baked Oatmeal is full of seasonal ingredients, applesauce, and warm spices for an easy make-ahead breakfast or a special holiday brunch! 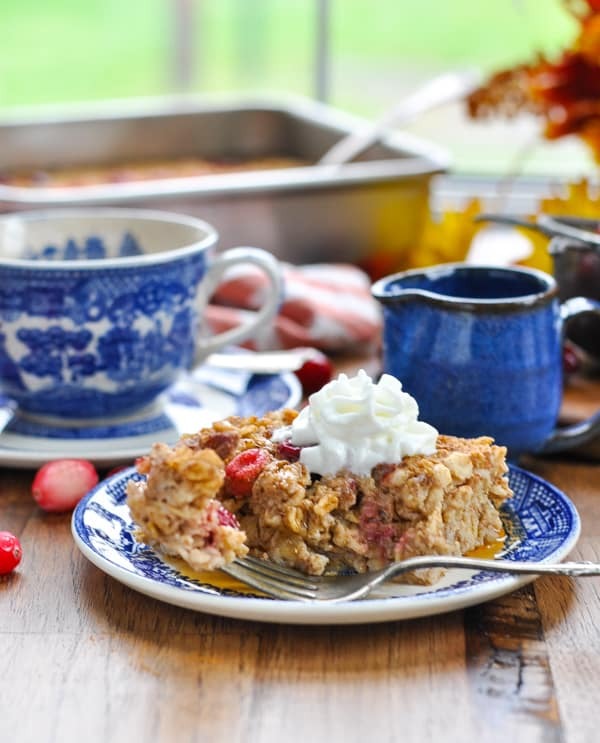 It’s officially the season for toasty, comforting breakfast casseroles! 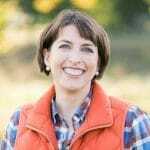 While I love a cold and refreshing protein shake or smoothie in the summer, I consistently find myself craving a warmer option when the seasons change. I am SO excited to share this gem of a recipe with you today, because it is officially one of my new favorite breakfasts. You guys, this baked oatmeal recipe is SO GOOD and it’s SO healthy! It’s perfect for meal prep since you can bake a pan over the weekend and enjoy it all week long, or you can prepare it the night before and have a beautiful feast to serve house guests in the morning. How do you cook oats in the oven? 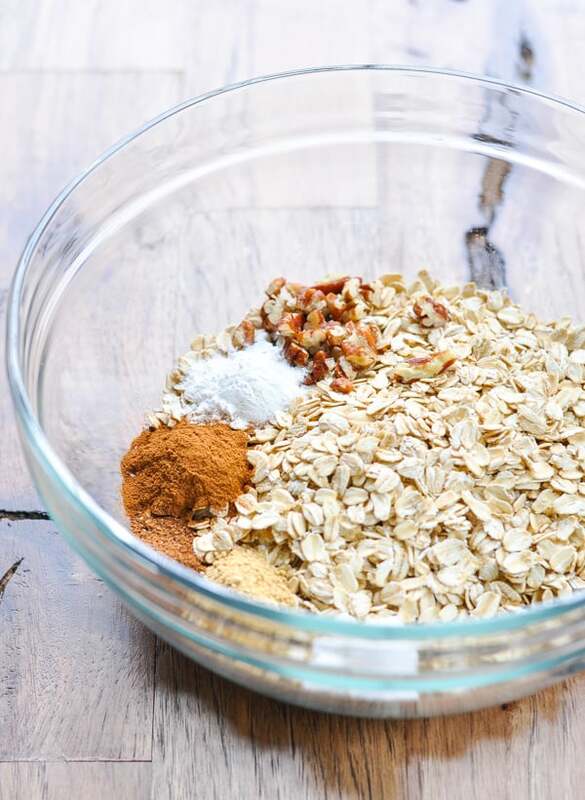 First, mix together the dry ingredients: oats, baking powder, chopped pecans, spices, and salt. 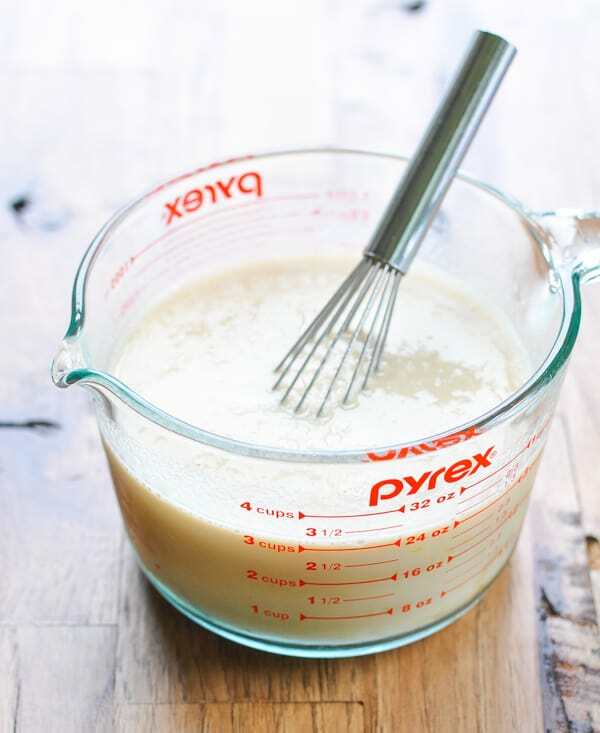 Next, whisk together the wet ingredients: maple syrup, milk, applesauce and egg. Combine the dry ingredients with the wet ingredients, fold in the cranberries, and pour it into an 8-inch square baking dish. The oatmeal bakes in a 375-degree F oven for about 30-35 minutes, or just until the center is set (but it’s still moist). Allow it to cool on the counter for about 10 minutes before slicing, topping, and serving! Can baked oatmeal be made the night before? Definitely! This is the ultimate make-ahead breakfast! 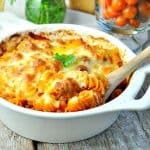 Bake the casserole, allow it to cool to room temperature, and then store to enjoy later. 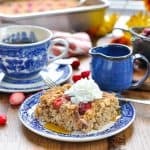 You have a couple of different options for storing this baked oatmeal breakfast recipe — either in the refrigerator or in the freezer. Once the oatmeal has been baked and cooled to room temperature, you can slice it into squares, place each square in individual containers, and store in the refrigerator for up to 4 days. Alternatively, you can allow the oatmeal to cool to room temperature, and then just place the entire dish (covered) in the refrigerator for up to 4 days. Yes! 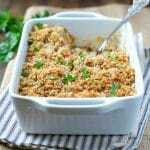 To freeze the baked oatmeal, prepare the casserole according to the recipe instructions. Allow the baked oatmeal to cool to room temperature, wrap tightly with plastic wrap and aluminum foil, and store in the freezer for up to 3 months. If reheating the entire pan of baked oatmeal, cover with foil and reheat in a 350-degree oven for 20 minutes. 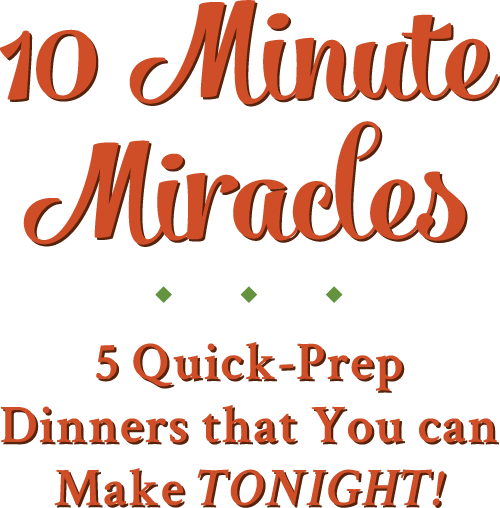 Alternatively, you can microwave individual portions on HIGH for 45 seconds – 1 minute. Absolutely! 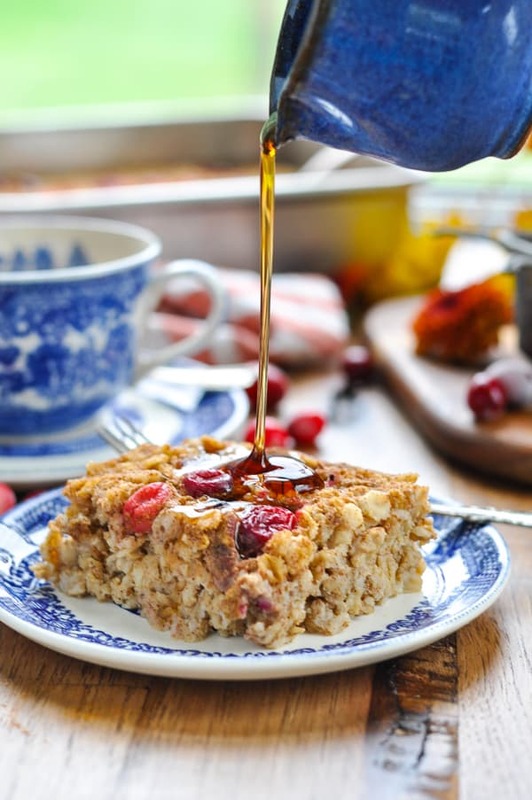 This baked oatmeal with applesauce and fruit is loaded with fiber, whole grains, anti-inflammatory warm spices, and antioxidant-rich cranberries. The pecans add some healthy fat (and you can increase the nuts for even more satiating fat, if desired). 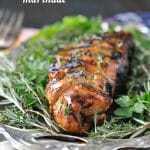 This recipe yields 4 very large servings, or 6-8 smaller servings. If you’re serving a larger crowd, I recommend doubling the ingredients and baking in a 9 x 13-inch pan. You may need to increase the baking time to 35-40 minutes. Use sweetened dried cranberries instead of fresh or frozen berries.Use blueberries (or other fresh or frozen berries of choice) instead of cranberries. It’s a dish that you can adjust with the seasons! Omit 2 tablespoons of the applesauce and replace with 2 tablespoons of melted butter for a richer dish. Increase the amount of pecans in the recipe for more crunch, or substitute with almonds, walnuts, or chopped hazelnuts. Combine oats, pecans, baking powder, cinnamon, nutmeg, ginger, and salt in a large bowl. Combine syrup, milk, applesauce and egg in a separate bowl. Add wet ingredients to dry ingredients; stir until combined. Fold in cranberries. 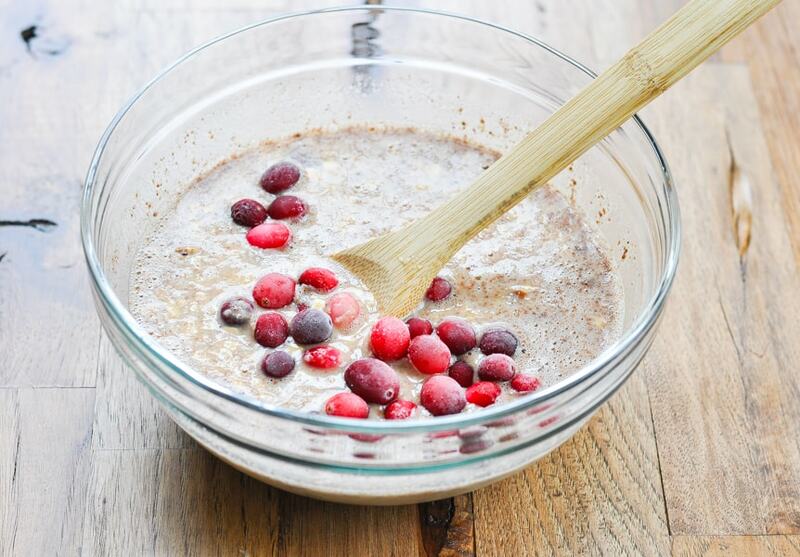 Pour oat mixture into an 8-inch square baking dish that has been coated with cooking spray. Bake for about 30-35 minutes (or until center is just set, but it’s still moist). Allow oatmeal to cool slightly for about 10 minutes before slicing and serving in individual dishes. Garnish with toppings of choice. This recipe yields 4 very large servings, or 6-8 smaller servings. If you're serving a larger crowd, I recommend doubling the ingredients and baking in a 9 x 13-inch pan. You may need to increase the baking time to 35-40 minutes. 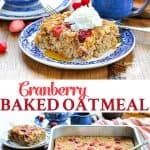 You have a couple of different options for storing this baked oatmeal breakfast recipe -- either in the refrigerator or in the freezer. If reheating the entire pan of baked oatmeal, cover with foil and reheat in a 350-degree oven for 20 minutes. Alternatively, you can microwave individual portions on HIGH for 45 seconds - 1 minute. This post was originally published in October, 2015. It was updated in October, 2018. Oh this oatmeal is just calling my name, Blair! I love the crumb topping. And the cranberries are just perfect for the season, too. Sounds like such a filling breakfast! Oh my goodness Blair…this looks outstanding!! 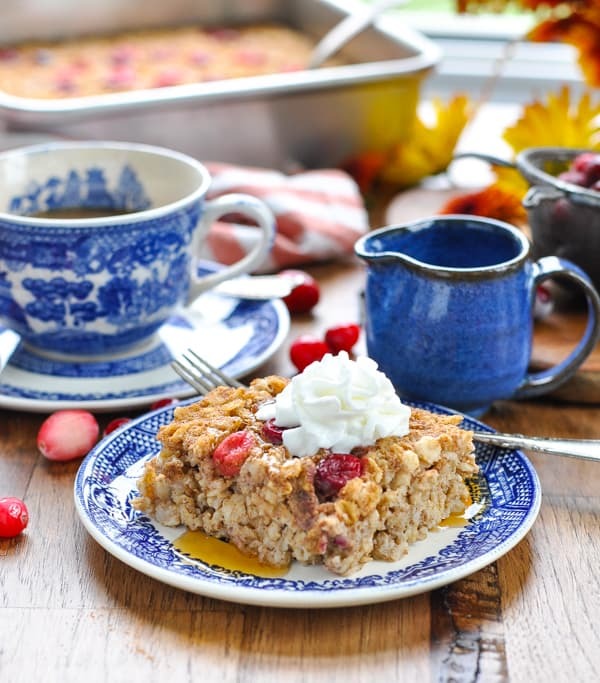 So many delicious flavors packed into this dish…the perfect fall breakfast!